In the 13th Century the region of Cognac in France was well known for importing and storing salt and exporting their wines into other Northern European countries. By the time the 16th Century came around, the Dutch came looking for wines from Bordieries or Champagne areas. The Dutch would ship the grapes or the wines back home and if the wines wouldn’t survive the trip home, they would be distilled. The distilled spirit would be called “Brandewijn” or “burnt wine” also known as Brandy. The Dutch would try to add water to the Brandy to see if it would taste like the original wine they shipped home. At the turn of the 17th Century double distillation was being used to to transform wine into Eau-de-Vie which was easier and cheaper to ship on boats. People also found out that the ship rides home actually mellowed and improved the spirit even more by spending time in French Limousin casks. This is when Cognac was really born. Unfortunately as distillation was coming about and glass making turned into a profitable business, phylloxera hit the vines and devasted the Cognac region. Around the 20th Century French vineyards are replanted with American rootstock which is immune to phlloxera. Some of the traditional grape varieties (Colombard, Folle Blanche) are replaced by Ugni Blanc which is more resistant and now makes up 90% of Cognac production. In 1936, Cognac is recognized as a Controlled Appelation of Origin, which means Cognac cannot come from any place else in the world. 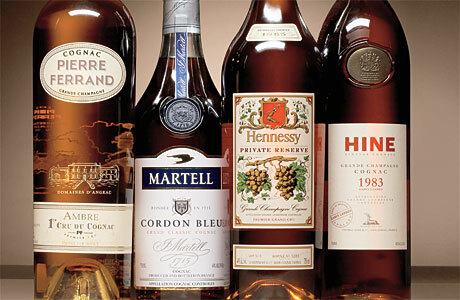 To this day Cognac is considered an icon of French distillation and quality. In the Cognac Region there are currently 5,233 grape growers who make wine for Cognac production. As stated above, the main grape for Cognac is Ugni Blanc, but Folle Blanch and Colombard are also involved. These grapes have high acidity and a low alcohol volume which makes it perfect for distillation. Most grapes will be picked throughout the month of October. After being harvested, the grapes will be pressed with a traditional horizontal basket press or a pneumatic bladder press to get as much juice out of the grapes as possible. The more juice produced, the more Cognac in the end. Following the press, fermentation will begin. Adding sugar (chaptalization) is prohibited by French law in the fermentation and production of Cognac. Four to Eight days after fermentation, the wines will be at about 9% ABV with a high acidity. Distillation will follow next and it must be completed by March 31st of the following year. The wines produced here are of the highest quality. They are light and floral. They benefit through long aging in casks to mature fully. The soil content in this Appellation is made up of clay, chalk and limestone. Petitie Champagne also has the same soil make up of Grande Champagne: chalky, clay and limestone. The wines produced here are similar in flavor and aroma, but are usually not considered to be the best Cognacs in the world. Aging of these Cognacs take a long time, but it’s well worth the grape flower aromas and the supple flavor. One thing to note is that there is a term “Fine Champagne”. This is not a region, but a blend of Eaux-de-Vie from Grande and Petite Champagne Applellations with a minimum of 50% Eaux-de-Vie coming from Grand Champagne. 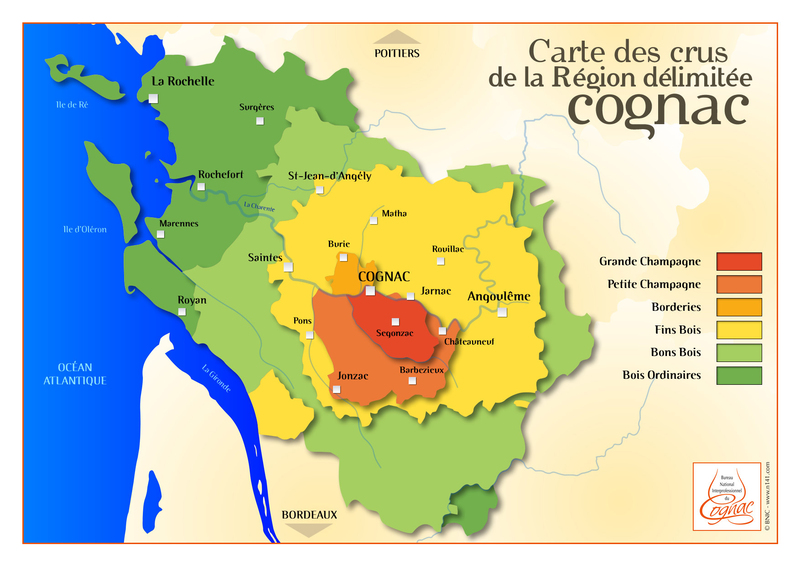 This is the smallest Appellation of the 6 Crus that produce Cognac grapes. Clay and flint make up the soil in this area. This region produces round Cognacs with a floral aroma similar to violets. Once put into barrels, the Cognac will not need long periods of aging to reach its maturity. The red clay and chalky soils cover this appellation. Grapes grown here will produce Cognacs that age quickly and have the aroma of freshly pressed grapes. The growing areas that touch the ocean contain sandy soils and the further you head in, vineyards will be surrounded by pine trees and chestnuts. The Cognac will age quickly once placed in barrels and will have aromas of toasted nuts and have a round and smooth flavor. This Appellation has the smallest amount of vineyards. The sandy soil is responsible for feeding the grapes that produces Cognac that ages quickly with some salinity in the final spirit. Cognac is distilled by a method known as the Charentaise Method. 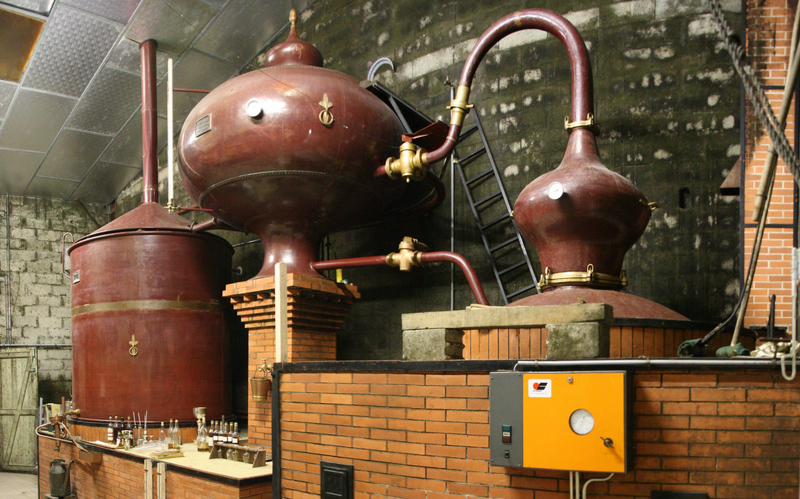 It gets the name from the still being used called a Charentais Still made from copper. Grapes from the Cognac Region will be pressed into juice and turned into a wine with high acidity and low alcohol content. The unfiltered wine will be put into the boiler and be brought to a boil. The alcohol will evaporate and be collected in the still head, where it will then make its way to the swan neck and onto the coil. Once the liquid cools it will become the “brouillis” which is a cloudy liquid with an alcohol content of 28-32% ABV. It will then be distilled a second time “la bonne chauffe” and be cut by the Master Distiller. The distiller is looking to cut out the heads and keep the heart, to make his or her Cognac. The alcohol content for the cut usually reaches about 60% ABV, but cannot exceed 72% ABV. Once the Eaux-de-Vie has been pulled off the still, it needs to spend time in oak casks. The wood will transfer flavors into the spirit as well as color and aroma to make it Cognac. All Cognac will be aged in oak barrels for a certain period of time. The oak is chosen because of its porosity, hardness and extraction characteristics. Certain trees will be cut down if a producer wants to have higher or lower tannins in their Cognac. Barrel makers will take heartwood or sapwood from trees that are over 100 years old. They will then split the wood and stack it in the open air for about 3 years to dry out and lose their sap and bitter flavors. Once they are ready, the staves will be toasted or seared to the cooper and distillers specifications. Most casks that hold Cognac will hold about 270-450 liters of spirit. Once the Cognac is placed in the barrels, the aging process will begin. It may take a couple of years or it could take 50 years to reach full maturity. It depends on how the Cognac interacts with the wood (it’s porosity) and the outside air. Cellar temperatures and humidity will all have in influence on evaportation and ageing of the spirit in the casks. The Cognac may absorb some of the woods flavor and color when it comes to the final product. By law, Cognac must spend a minimum of 2 years in oak casks before being removed and bottled. When the Master Distiller believes that his Cognac is ready to be removed from casks, he may blend them to mellow out flavors, put them into glass Demijohns to stop the ageing process, add demineralized water to reduce the proof (but no lower than 40% ABV) or just move the casks to a different warehouse. One thing I did find troubling is that taste adjustments can be made to Cognac with sugar, caramel, wood shavings and distilled water before being bottled. V.S. (Very Special), 3 Stars, Compte 2: The youngest Eaux-de-Vie in the bottle is atleast 2 years old. V.S.O.P. (Very Superior Old Pale), Reserve, Compte 4: The youngest Eaux-de-Vie in the bottle is atleast 4 years old. Napoleon, X.O. (Extra Old), Hors d’age, Compte 6: The youngest Eaux-de-Vie in the bottle is atleast 6 years old. In 2016, the youngest Cognac in the bottle will have to be 10 years old. Vintage Cognacs: The year on the label indicates that the Eaux-de-Vie comes from a harvest from that year. Geographical Indication: If the label states “Cognac Grande Champagne” it means that 100% of the Eaux-de-Vie comes from that Appellation area.